Wicked Destiny, Wicked Witch Book One is the first in the newest series by L.C. Hibbett. This book takes place in Ireland, someplace I would love to see myself. A nice addition to this book one is the prequel. I much preferred this as I didn’t have to hunt down a different anthology looking for the why for this book. 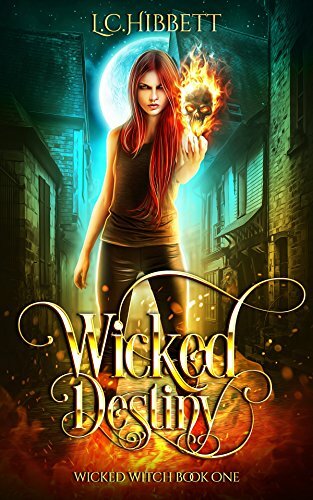 Wicked Destiny follows Destiny O’Neill on the run and in hiding with her aunt and her young daughter, Saoirse, from her father Balor, an actual god. Destiny works in The Paper Heart, Galway’s coffee shop and gallery. She has been hiding out for three years after taking off after realizing she no longer wanted to be a weapon for her father. Destiny is a bit different, she is a black witch having power over life and death. She has been told so many times that nine out of ten black witches go bad, and she wants to be the exception. Destiny works towards not making friends, but no matter what she catches the eye of her boss Nick, a tiger shifter. When Destiny has to flee after the chance of being found out, a man from her past shows up to save her. Patrick is human, but can see the future in bits and pieces. Though the shock hits Destiny when she sees her old flame Markus, a red witch as she left behind. Patrick and Destiny agree to look for children that have been snatched from their homes. This brings Destiny face to face with IGS (International Guild of Supernaturals) and parts of her life become blurred. L.C. Hibbett blends a previous story, Beauty’s Beasts and introduces know characters. Unlike Beauty’s Beasts, this is a slow burn Reverse Harem. I enjoyed Wicked Destiny. L.C. does a good job of bringing in her previous characters seamlessly into the new story. Destiny was an interesting character, she was written well as a person that had been hurt and was hiding out. This book pulled off a slow burn so well. Destiny has as she puts it her past, present and future in the three men before. Nick even through all of his mistakes still might be one of my favorite shifters in this series, even with Izzy’s boys brought back. I love Mac and Teddy so loved seeing them back even though they weren’t in it much. Looking forward to more in the series.